U.S. ARMY GARRISON-HUMPHREYS, South Korea - As U.S. 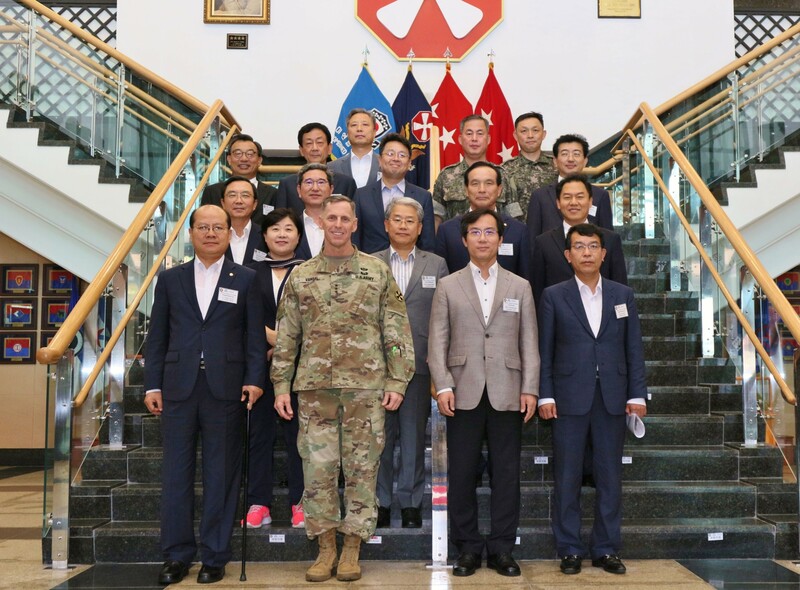 Forces Korea's transformation is now in full swing on the peninsula, members of the National Defense Committee took the occasion to visit the Eighth Army headquarters and learn about the unit's blueprint at Camp Humphreys in Pyeongtaek, South Korea, Aug. 23. The National Defense Committee is a parliamentary organization subordinate to the National Assembly of the Republic of Korea. The committee works as a key decision maker for ROK military and defense policies while facilitating the ROK-U.S. Alliance. 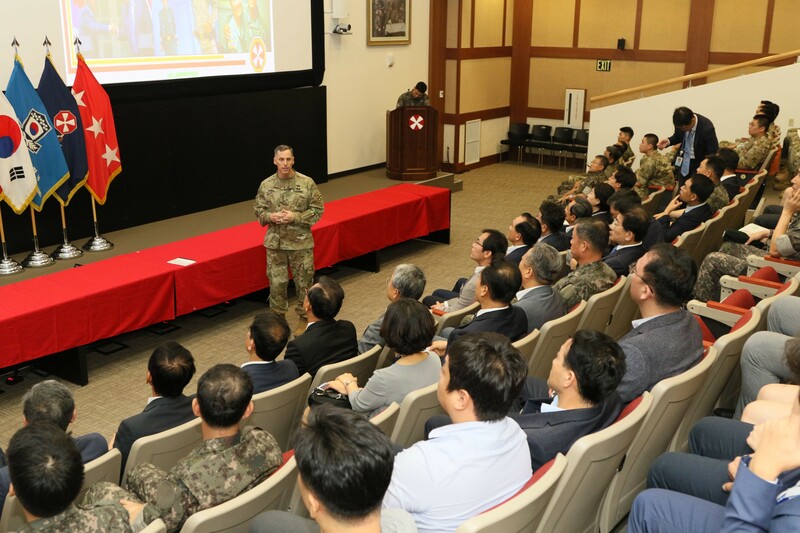 In order for the committee to have a deeper understanding of Eighth Army's mission sets and the current status of the transformation in progress, the visit consisted of a tour of the installation and a series of briefs and remarks. Eighth Army Commanding General, Lt. Gen. Thomas S. Vandal welcomed the committee and served as the main presenter to update the committee on the status of the transformation process. "The transformation is a 10.7 billion dollar project that started, as many of you know, well over 10 years ago," Vandal said. "It is a reflection of the enduring commitment of the Republic of Korea and the U.S. to the ROK-U.S. alliance." 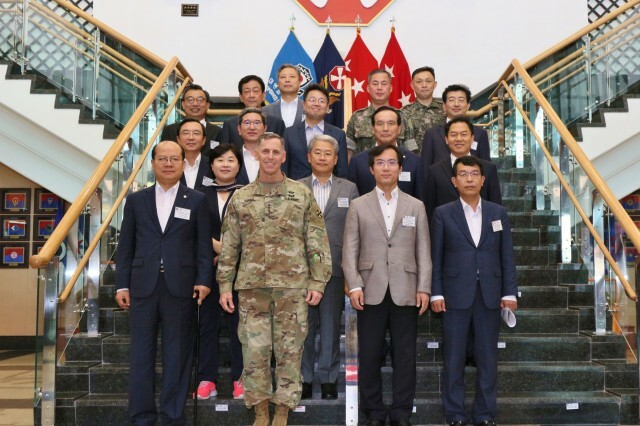 According to Vandal, with the construction approximately 80 percent complete, USFK has transitioned from the construction phase to the movement phase. Camp Humphreys is known to be the largest overseas installation not only by space, but also by population as it will have more than 40,000 Soldiers and civilians once the relocation is finished in 2020. Vandal expressed his gratitude for the ROK government's support for the transformation and the Alliance. 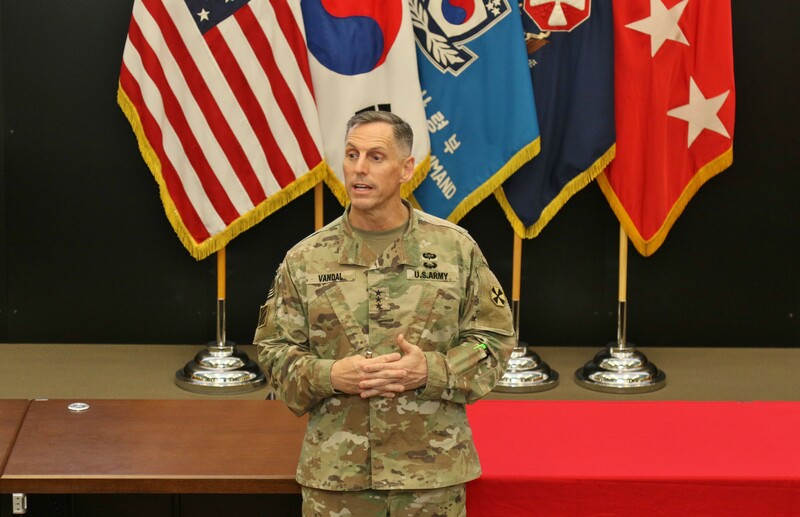 "Camp Humphreys is what we describe to you as the crown jewel of overseas assignments for U.S. forces," Vandal said. "Our Soldiers are very grateful, and I will tell you personally 'thank you very much' for the support and all that you have done to help build this alliance." Vandal reminded the committee about the storied history of Eighth Army's fidelity to the Alliance for over six decades. "Eighth Army arrived in July 1950 and never left," Vandal said. "We will stand by your side. We have an enduring commitment to the Republic of Korea, and this ROK-U.S. alliance has endured for so many years and is such a strength for the security and serenity of the Korean Peninsula." Vandal said Eighth Army has been uniquely organized to form combined joint task forces with the ROK Army for specific missions on the peninsula. "Our Alliance is strong and continuing to get stronger all the time," said Vandal. "We are more combined than we have ever been." Vandal also described the Korean Augmentation to the U.S. Army program as one of the embodiments of the strong bond between the two countries. "Another example of how combined we are is the KATUSA soldiers," Vandal said. "They are an integral part of every one of our headquarters and an integral part of every one of our units at echelon, per the agreement that occurred back in 1950 on a handshake between Gen. Douglas MacArthur and President Lee." Vandal concluded his remark by confirming Eighth Army's determination to successfully defend South Korea as a member of the Alliance. "Eighth Army is ready to fight tonight," Vandal said. "We've been an integral part of this alliance for the last 67 years, and you have my enduring commitment that no matter what provocations, no matter what aggressions North Korea may take, Eighth Army will be ready as part of the Combined Forces Command." The chairman of the NDC, Kim Young-woo briefly spoke on behalf of the committee in response to Vandal's remarks. Kim said Eighth Army is an essential part of sustaining the Alliance and stressed the importance of maintaining its operational readiness. "Eighth Army and its Soldiers have dedicated themselves to defend South Korea for the last 67 years," Kim said. "As far as I'm concerned, they are the pivot for the ROK-U.S. Alliance. We will make sure our Alliance is stronger in the future and always ready for any possible North Korean provocations and threats."